Some journalists will do just about anything in the pursuit of a good story. Independent reporter Miles Upshur is one of those. Acting on an anonymous insider tip, Upshur’s made his way into the remote Colorado Rockies, where lies the supremely sinister Mount Massive Asylum. Operated by the highly controversial Murkoff corporation, the asylum’s been engaged in some downright twisted stuff, all of which has, until now, remained top secret. Perhaps it should have stayed that way. Before I dive into the specifics of my review, I’d like to make something clear. See, I’ve heard a lot of people comparing Outlast to A Machine For Pigs, saying the former is more frightening than the latter. To me, this isn’t a fair comparison – they’re two entirely different games, each with its own very different approach to horror. Think of Outlast as a howling, enraged predator, one whose very presence strikes terror deep into your heart. You know when it’s near, you know when it’s hunting you, yet you can’t help but be scared witless as you run desperately away. Machine For Pigs, on the other hand, is a subtler, more sinister kind of beast; one which burrows its way far into your psyche, waiting until you’re most vulnerable before lashing out. Neither approach to horror is really objectively ‘better’ – I myself prefer Machine For Pigs, but I know there are many of you who’d enjoy the former more. Right. Now that we’ve got that out of the way, let’s talk a bit about Outlast. Like most great survival horror titles, Miles is effectively helpless. Sure, he’s pretty agile – there are some light parkour elements which will see you scrambling up the sides of buildings and vaulting over obstacles in the midst of a chase – but at the same time, he’s not exactly a martial artist. If you get yourself caught, you’re pretty much hooped. 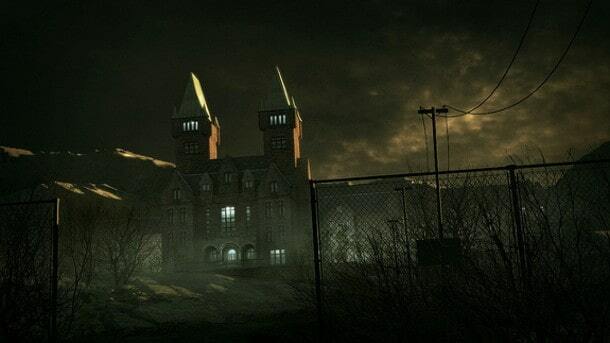 In addition to Miles’ agility, you’re equipped with a video camera that comes complete with a night-vision attachment; this is the only thing that’ll allow you to see where you’re going (and more importantly, see where your pursuers are) in the asylum’s gloom. Use of this feature takes a heavy toll on your camera’s battery life, however – you’ll need to be constantly on the lookout for more batteries in order to keep yourself charged up and ensure that you’re actually able to see where you’re going. You’ll need to be careful how much you film, and do everything in your power to conserve your camera’s lifespan. Trust me, you don’t want to have it die on you in the dark. A horror game is only as good as the monsters it throws at you, and Outlast doesn’t disappoint in that regard. Most notable among the creatures that pursue you through the asylum are the hulking, brutish Chris Walker – rarely did I feel so helpless and hunted as when he was stomping about searching for me – and the abnormally cheerful Richard Traeger(though I found that sequence to be a bit more entertaining than frightening). Outlast may not have disturbed me as much as A Machine For Pigs, but it’s still an in-arguably frightening game, complete with top-notch graphics, excellent sound design and awesome (if occasionally sluggish) controls. Oh, it’s also longer than four or five hours; so that helps. Pick up a copy for yourself on Steam for $19.99.